Is This 'International Flag of Planet Earth' the One We'll Plant on Mars? Artist's conception of an astronaut planting the International Flag of Earth on Mars. A Swedish university student has created a design for an "International Flag of Planet Earth" that could be planted on alien worlds during future human exploration missions. The student project, which Oskar Pernefeldt undertook for a bachelor's degree in fine arts at Beckmans College of Design in Stockholm, features several interlocked white circles on a blue background. (See more views of the International Flag of Planet Earth. )The flag is intended to remind people that we all share planet Earth, regardless of nationality, Pernefeldt said. "Current expeditions in outer space use different national flags depending on which country is funding the voyage. The space travelers, however, are more than just representatives of their own countries. They are representatives of planet Earth," Pernefeldt wrote on his project's website. And international cooperation will likely be a big part of any future human missions to Mars and other farflung destinations, not least because of the high costs associated with such an undertaking, exploration advocates say. "The scientific study of flags is called vexillology, and the practice of designing flags is called vexillography," Pernefeldt added. "Both of these are an outcome of heraldry. In these practices there are different unofficial design rules/customs, about colors, placement, proportions, typography and aestethics in general. This proposal is accurate according to the regulations regarding flags." 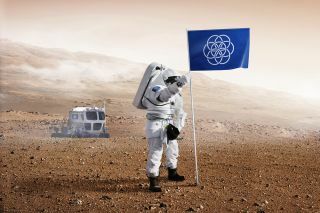 The proposed International Flag of Planet Earth by student Oskar Pernefeldt of Beckmans College of Design in Stockholm, Sweden. While the project website does not mention any plans by space agencies to use the international flag, several pictures from Pernefeldt depict it being used on spacesuits, on a Mars base and in Antarctica. Pernefeldt acknowledges the help of several entities on his website, including NASA, LG Electronics and several experts in astronomy, design and chemistry, among others.